Hurricane Shutters – How Do I Know If Mine Will Meet Florida Code? When it comes to Hurricane Shutters you need to know that they will indeed stand up to, well, a hurricane. Your Hurricane Shutters will be that first line of defense that keeps your windows, and the inside of your home, intact. To make sure that Hurricane Shutters will indeed stand up to their name the State of Florida requires independent testing and review by a Florida licensed professional engineer. Once they have verified that the shutters will indeed withstand a hurricane the product is approved. While hurricanes strike all over the country, those with the highest winds hit Florida in the Miami-Dade and Broward Counties. These make up the High Velocity Hurricane Zone also known as HVHZ. 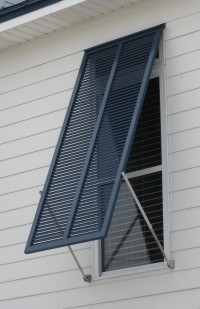 Some hurricane shutters are strong enough to be approved for use within the HVHZ while others are not as durable and can only be used for hurricane protection outside the HVHZ. I know that I need Hurricane Shutters. Now what? When you are ready to add hurricane shutters to your home or business a good first step is to check with your insurance company. They will be able to give you any requirements for you location. When you are talking with a retailer of hurricane shutters here is some information that you will want to check. FL# – This is the application number. It will start with “FL” and then the application numbers. When there are revisions there will be an “.R” afterwards with the revision number. Revisions can be a change in the design of the hurricane shutters or even a change in the way they are installed. It is important to note the revisions as while one might have passed another might not have. Application Status – Just because there is an application does not mean the the shutters were approved. The Application Status will let you know whether these exterior shutters have been approved or not. Limits of Use – This is the part to which you will need to pay special attention. This section will tell you if the shutters have been approved in the HVHZ or only approved in the rest of Florida but NOT the HVHZ. It will also give you the design pressure and let you know if they are impact resistant. You can sometimes also find size restrictions here. Description – Here you can also find size restrictions for the hurricane shutters. Installation Instructions – On the application report there will be a link to a PDF that gives the approved installation instructions. This is a very important section to read through. Even if your exterior shutters are approved for hurricane protection they will only perform properly if you install them as shown in the instructions. When you are looking at a retailer for hurricane shutters make sure that they can provide you with all of this information, for the safety of your home and family. You can follow this link for more information on our HVHZ approved Hurricane Shutters.